You choose from any of our 16 oz. dill pickle variety or relishes. GREAT FOR DEVILED EGGS SWEET AND SOUR GREAT ON HOT DOGS WHAT CAN I SAY "WE LOVE THEM"
From Beverly Jenkins of Lincolnton, North Carolina on 4/26/2018 . I've been buying pickles and relishes from your company for years. I am particularly fond of your sweet pickle relish. I no longer buy any that I might find in the grocery store. From Anonymous of Carmel, Indiana on 6/29/2017 . I couldn't fine your relish in any of the stores in my area and tried quite a few different substitues but non of them compared to yours so I went online and found that I was able to purchase it through you. thanks it is the best relish around. From Paula Kerr of Indianapolis, Indiana on 6/25/2016 . Our family reunion was complete. Our hot dog and Hamburger station had pickles for everyone's taste. Thank you Sechler I wouldn't use anything else in my potato salad. From Paul T Goodman of San Diego, California on 4/14/2016 . Everything is yummy! Salsa perfection. Bread & Butter pickles are so good. 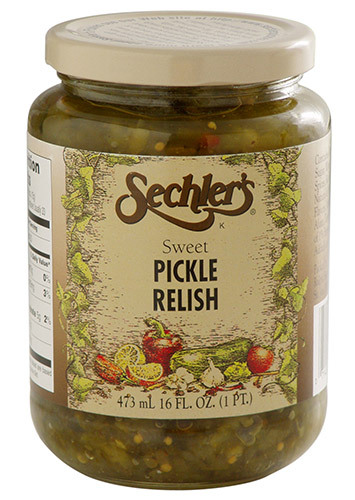 Sweet relish is a staple here. Green tomatoes and a nice surprise.